Former Delegate Jill Carter was sworn into the State Senate after being appointed by Governor Hogan to fill the District 41 seat vacated by former Senator Nathaniel Oaks. Senator Carter, who previously served 14 years in the House of Delegates, was appointed to serve the remaining 8 months of the term. Senator Carter has also filed to run in the June 26 Democratic primary election to hold the 41st District Senate seat for the next four years where she will face former teacher J.D. Merrill in the primary contest. 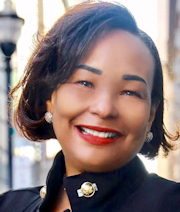 She resigned her House seat in January 2017 to lead the Office of Civil Rights and Wage Enforcement for the newly elected Baltimore Mayor Catherine E. Pugh (D). Additional coverage can be found in Maryland Matters.